Peperomia have all the features of a good houseplant: variability, interesting leaves, and a high tolerance for a relatively wide range of conditions. Smooth and fleshy leaves grow on threadlike stems. These make great desk plants or additions to dishgardens. GROWTH & CARE General Care Instructions for Succulents & Cacti. Water plants well, but not too often. Water more often in summer than in winter. Soak when dry; then allow them to dry well before watering again. Our plants love a bright location. They prefer warmth and light. Do not put Aloes, Haworthias or very small cacti in full sunlight. Plants should be kept, if possible, between 45° and 90°. Higher temperatures may be tolerated if good ventilation is available. Cooler temperatures may be tolerated if plants are drier. Cacti do well in small pots. The roots do not require a lot of room. Cacti may be transplanted any time, but preferable in the spring. Use a good, well-drained soil. We recommend a balanced water-soluble fertilizer at regular intervals during warm weather. 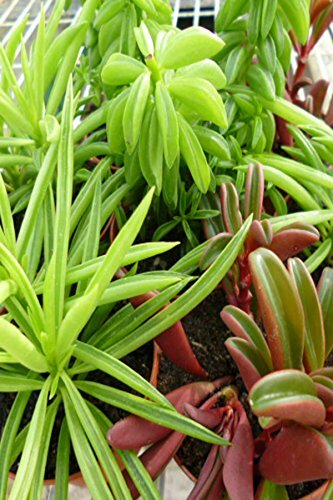 Mix at about half the concentration recommended for leafy plants. For GRAFTED CACTI, do not allow any green shoots to grow on the stem of the plant because this takes away the strength which the top requires. These green shoots may be cut off with a sharp knife without damaging the plant. By supplying sufficient sunlight and adhering to the watering instructions, yours plants should enhance your home for years, as well as provide a delightful conversation piece.